Digital world is overtaking the physical world in every aspect of human life. Twitter and Facebook have digitized social relationships; Netflix has replaced family movie outing; XBOX, Nintendo and Sony have replaced indoor family time and to some extent even outdoor games / activities. 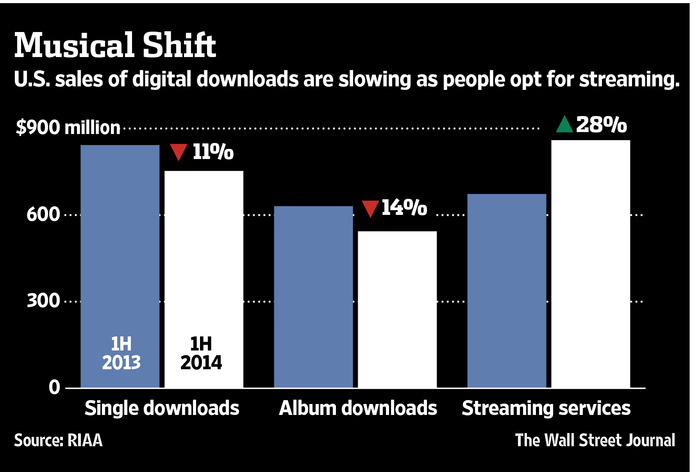 This month Revenue from online streaming of music (such as Pandora, XBOX, Spotify, Rhapsody, etc.) outpaced physical CD sales for the first time yet again demonstrating the triumph of digital over the physical giving us another chance to witness the forces of Creative Destruction in action. In my earlier practice as a finance consultant, I have seen how retail stocking decisions are made. It’s a delicate balance between catering to the mass appeal / trends of the season and providing unique exclusive niche items that appeal to a special few. The eventual goals of the stocking decision being a) maximize inventory turnover as a ratio of sales (i.e. number of times the entire inventory is sold) and b) minimize inventory obsolescence risk. Given the cost of shelf space is extremely high and is limited by the shop floor plan, retail stores generally optimize for inventory that sells more i.e. 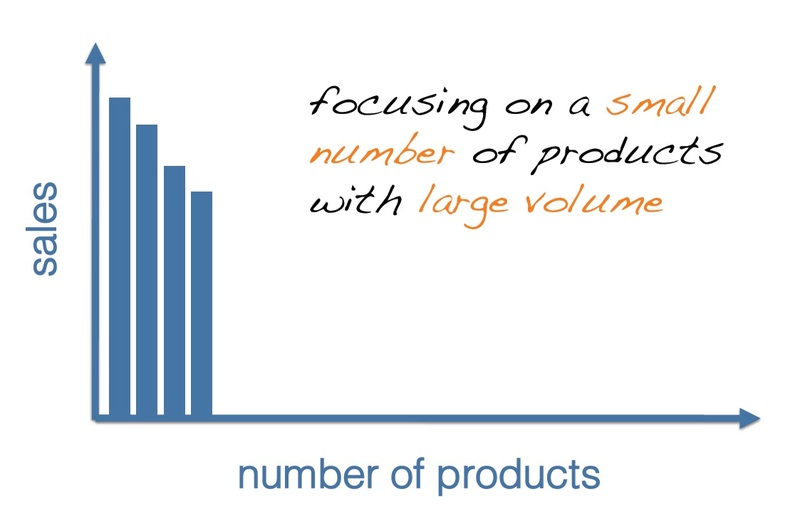 focus is on stocking smaller number of products with large sales volume potential or selling more of less. This book began with a quiz I got wrong… Robbie Vann-Adibé, the CEO of Ecast, a “digital jukebox” company… asked me to guess what percentage of the 10,000 albums available on the jukeboxes sold at least one track per quarter. I knew, of course, that Vann-Adibé was asking me a trick question. The normal answer would be 20 percent because of the 80/20 Rule, which experience tells us applies practically everywhere. That is: 20 percent of products account for 80 percent of sales (and usually 100 percent of the profits). But Vann-Adibé was in the digital content business, which is different. So I thought I’d go way out on a limb and venture that a whopping 50 percent of those 10,000 albums sold at least one track a quarter. I was, needless to say, way, way off. The answer was 98 percent. Vann-Adibé said. “Everyone gets that wrong.” Even he had been stunned: As the company added more titles to its collections, far beyond the inventory of most record stores and into the world of niches and subcultures, they continued to sell. And the more the company added, the more they sold. The demand for music beyond the hits seemed to be limitless. 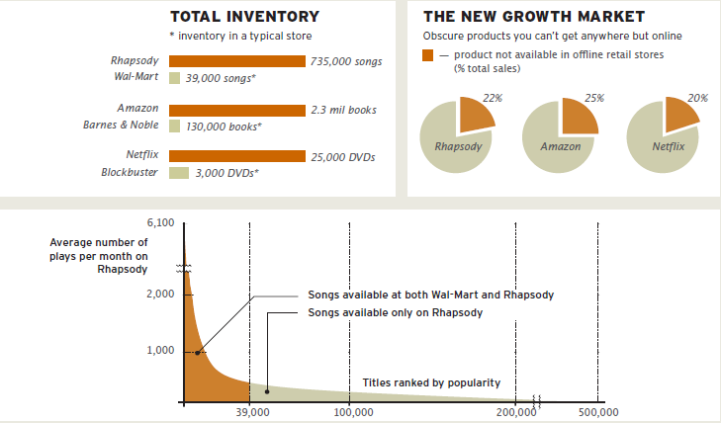 True, the songs didn’t sell in big numbers, but nearly all of them sold something. Chris further observes that there are more niche titles than the hits. Only because the cost of carrying such niche titles is high, retailers do not sell them. Chris argues that with the advantages of digital economy, offering such niche titles / items create new growth opportunities. Look at the chart below that provides a good overview of comparison between digital business and physical business and new growth opportunities for obscure (niche) products. As you can see from the chart above, Long Tail in the context of retail sales strategy is ‘selling less of more’ (Long Tail) in addition to ‘selling more of less’ (Tail Head). This strategy is used by many of the popular online businesses such as Apple in its itunes and app store, Amazon in its listing of zillion products, XBOX in its infinite games online, Netflix in its more than 100,000 titles etc. As a consumer of digital goods, we will continue to see such large niche variety being made available to us. So what is a Long Tail? Long Tail as a name is popularized by Chris Anderson in the above mentioned book. This is a very old mathematical concept known by many names such as Power Law Distribution, 80-20 rule, Pareto Distribution, Zipf’s Law, Extremistan, etc. Technically speaking Long Tail or Power Law is the mathematical relationship between two quantities in which one varies as a power of the other. Easy way to understand this is to think of number of people who are mega Billionaires (Bill Gates, Warren Buffet, Carlos Helu, etc. ), medium-sized Billionaires (Rupert Murdoch, Mukesh Ambani, Paul Allen, etc. ), Millionaires, Half Millionaires, Hundreds of Thousanders and everybody else with positive net worth. Alternatively think of Twitter followers: there are a few people with tens of millions of followers, far more with millions or hundreds of thousands of followers, and a huge mass with a few hundred followers or less. If the data sets from these two examples are plotted on a graph (X axis with number of people and Y axis with net worth or followers), you will see the distribution to look like this. 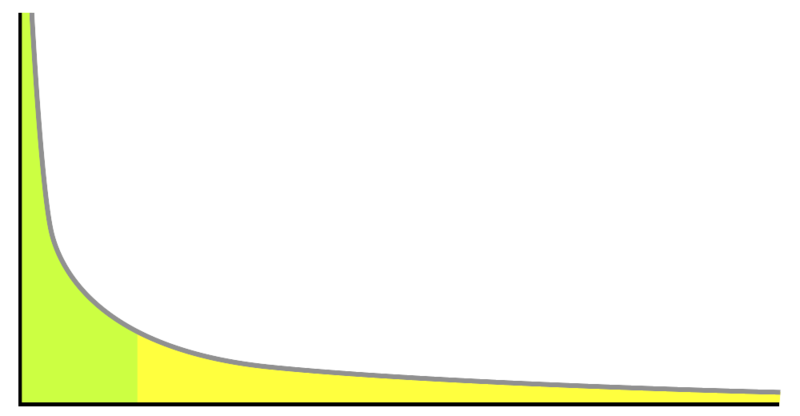 The super-rich and the super popular twitter accounts are smaller in number and are represented by the head of the tail (green section) and the rest of the population is large in number and represented by the long tail (yellow section). Where else does this phenomenon occur in real life and why is it important to know? Matters that seem to belong to Extremistan: wealth, income, book sales per author, book citations per author, name recognition as a “celebrity,” number of references on Google, populations of cities, uses of words in a vocabulary, numbers of speakers per language, damage caused by earthquakes, deaths in war, deaths from terrorist incidents, sizes of planets, sizes of companies, stock ownership, height between species (consider elephants and mice), financial markets (but your investment manager does not know it), commodity prices, inflation rates, economic data. The Extremistan list is much longer. On the continuum of the power distribution curve it pays to know where the item of your interest fits and who the competitors are. Be it in the domain of investments evaluation, professional networking or impact of major decisions that belong to the Extrimistan, this model provides a new lens to view the world and make meaning out of it. With the digitization of everything around us, it is wise to understand this concept so that we can identify opportunities created by the Long Tails.